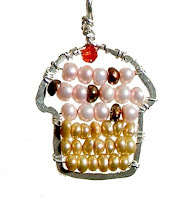 Check out this adorable cupcake necklace! 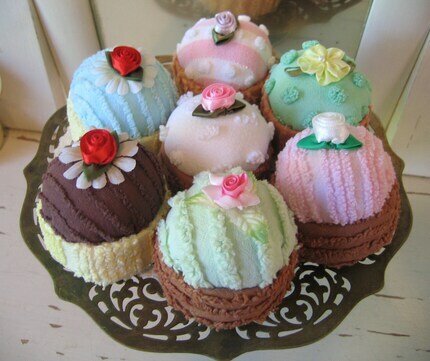 I was searching around on etsy and pixelgirl.com for something cute and cupcakey for my sister's 12th birthday. I found some cute earrings but decided that my sister probably wouldn't wear them. (She is sadly not into jewelry as much as I am....yet). So I sat at my jewelry table and hammered this out. I started with wire that I shaped into a cupcake-like form (I guess it could also be a mushroom). Then I wired some freshwater pearls across to "color in" the cupcake. I was so excited about it until my fiance told me he thought it was a really cute mushroom! Hmmm.. maybe my sister would think it was a mushroom, too. So, I decided to get her some silly rubber stretchy gooey things that she is way more into than jewelry, and listed this on etsy. You can check it out here. I think it's cute and that it looks like a cupcake, but sometimes you get so close to your project it's hard to see it from another perspective.